Time to look at kicker options this week, friends. Bob is back with advice if you're in a bye week pickle or just want to upgrade your kicker from mediocre to well-researched and promising. Hello again, it’s time for some more wisdom on Placekickers, or as I like to call them, Pointsgetters. Yep, a lot of people forget how important the PK can be. Gostkowski has a total of 129 points so far this season. In terms of other positions, that would place him as the 12th highest points for a RB. He would be the 15th highest WR, the 5th best TE, and the #1 DEF!! So where’s the respect for Mr. Last Picked in the Draft? To be honest, the position doesn’t get a lot of attention due to the small differential between kickers. Most just think, I can put anyone in there and expect 6 points a game. But many will draft the better kickers earlier in the draft, so there’s some respect there. But I digress. The top 8 starts of top 12 owned turned in a good week, averaging 11.2. Our recommendations averaged 8.25, with the overall average of 8.12. So we beat the average. 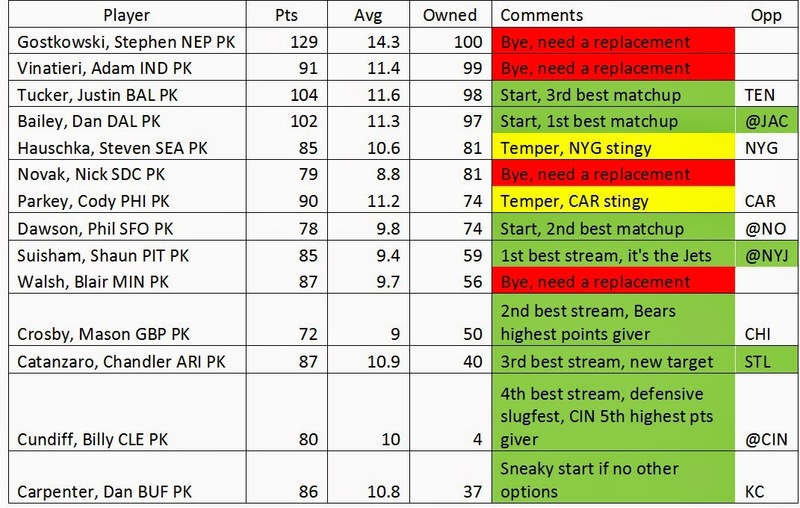 However, if you take out the top 8 starts of highly owned PKs, the average of the leftovers was only 6.7. So we did above average on two and just less than average on the other two. A moderately successful week for those of you without the top 8 starters. Last week I included a list of factors that could be used to help determine a kicker’s performance on a weekly basis. One important factor I left out was the effect of indoor or dome stadiums. Many believe that kicking in a dome as your home field will help you with points over the season. And I’m sure there is an effect; just ask kickers where they would prefer to kick, you know the answer. But just how much of a factor a dome is becomes a bit more muddled. Here are the 8 teams that have indoor, retractable, or domed stadiums: DAL, NO, ATL, HOU, STL, DET, ARI, and IND. Notice there are only 2 in the AFC and both in the South Div, which means that HOU and IND will play 10 of their 16 games inside. The NFC kickers not in a dome have a 6-in-15 chance of playing indoors. The indoor NFC kickers will have 8 plus a 6-and-16 chance of playing inside. I only mention these facts to illustrate that indoor kickers have to kick outside sometimes, and they may not be as acclimated to outdoor factors as the seasoned outdoor kicker. On a side note, MIN used to be in a dome, but will play outdoors for this and next season before they move into their new dome. Now onto to my favorite part…the numbers. Four of the top 8 points leaders this year have indoor home stadiums. But to temper that, consider the teams they play for; DAL, IND, HOU, ARI. That’s a combined 23 wins and 12 losses, pretty good teams. But then, the other four languish far behind. Prater is an outlier due to starting midseason, his average is 22nd. So nothing here suggests that indoor stadiums are a big advantage. However, overall average points for indoor kickers is 9.6 compared to 9.1 outdoor kickers. That’s a half point edge and that’s about what I think the advantage is. I don’t think it compares to how good the kicker is, or which team they play for, or which team they are opposing, be it a low or high offensive opponent. But I do think it’s a factor, and one I would use when breaking a tie. If I had equal opportunity for Bailey and Gano on a given week when both teams were home, then I would pick Bailey, because he would be kicking out of the elements. On to this week’s gifts. Shawn Suisham, a reliable kicker going against the Jets. Jets will slow the ground game, PIT will be in the red zone often, and give Suisham lots of opportunities for FGs. Mason Crosby, an iffy kicker at times, but CHI is giving up the most PK points in the league. You start him confidently. Billy Cundiff is back again, so you may not have to waiver a new one. This will be a slugfest with a lot of drives ending in the red zone, so there will be opportunities. Finally, for a flyer, I like Dan Carpenter to get his opportunities against a game Bills team that will stall in the red zone against a good KC defense. There you have it, if you don’t have one of the highly owned every week start kickers, look to PIT, GB, ARI, and CLE for nice replacements. And if you can’t get them, feel confident to start the kicker from BUF as a flyer.